Moses has grown up in Pharaoh’s house but after killing an Egyptian for beating one of the Hebrews, he is forced to flee. He flees to Midian on the Sinai peninsula and marries Zipporah, daughter of Jethro. Time has passed. The Pharaoh who sought his life has died and the conditions of Israel’s slavery has become more and more oppressive. The passage says that he is shepherding “beyond the wilderness”, a mysterious (and virtually unknown place) beyond normalcy and what is expected. This is Moses’ commissioning. The Holy Ground is dangerous but Moses seems naïve’ and unaware of what it is. This is the interplay of divine power and human innocence. The innocence manifests in a total dependence upon a God who would mingle with Creation. No longer is God inaccessible. The bush is, in essence, “God incarnate”. We Christians speak of the Incarnation as God’s coming to this earth in the form of Jesus Christ and, yet, this, too, is an incarnation, God manifest in this world. The name YHWH (translated, here, “I am who I am”) was finally revealed as God’s name. In respect, this name was only spoken in worship. Slowly over time, the name was spoken only by the priest, then the high priest, then not at all. 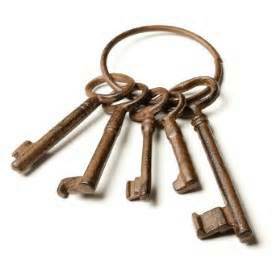 Hebrews believed that naming something revealed the power of that thing and shifted power to the one who held the name. So when Moses asks for God’s name, he seeks power over God. But when he heard the name, he was changed. God changed Moses; Moses did not change God. In fact, notice that (contrary to the way we often see this story depicted), the bush did not appear right in front of Moses. Rather, Moses had to turn aside from himself, from his own life, to see the bush. He actually had to go a little out of his way, a little off the path on which he stood, to look more closely and discover it. It is important to note that the bush was not consumed. God does not destroy, but rather enkindles. 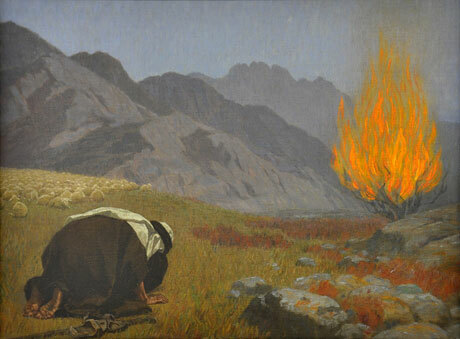 In The Life of Moses, 4th century theologian, Gregory of Nyssa, says that “from this we learn also the mystery of the Virgin: The light of divinity which through birth shone from her into human life did not consume the burning bush, even as the flower of her virginity was not withered by giving birth. That light teaches us what we must do to stand within the rays of the true light: Sandaled feet cannot ascend that height where the light of truth is seen.” (Gregory of Nyssa, The Life of Moses, p. 59) God does not destroy; God reveals. Essentially, our souls must be bared to encounter God, to enter that incarnation and to become who we are before God. God changed Moses; Moses did not change God. There is an Hasidic tale about Rabbi Zusya. When he was an old man, he said, “In the coming world, they will not ask me: ‘Why were you not Moses?’ They will ask me: ‘Why were you not Zusya? '”ıı Tell me, what is it you plan to do with your one wild and precious life? Surely it is true that God who created the heavens and the earth would have found another way to speak even if Moses had not stopped. Yet, there is a clear sense in this story that Moses’ turning aside brought forth God’s speech… But here, God did not speak until Moses turned aside. It is one of God’s great inefficiencies, this waiting for human beings to turn aside. “Immortal, invisible”…inefficient. Story after story in scripture points to God’s inefficiency. It is an inefficiency born of relationship. Bound up in the very nature of God who longed not only to be, but to be with. Could it be that if we turned aside more often God would speak more often? It is my calling as a pastor to spend time thinking about God, teaching scripture, praying with people in the hospital, comforting those who mourn. But I can tell you how very hard it is to turn aside, to find some time each day not only to think about God but to come into the presence of God in silence. To take off my shoes believing the place where I stand is holy ground. My days are consumed by my red “Minister’s Desk Calendar” rather than turning aside. It must be harder still for you. At least my job description includes reading scripture; most likely, yours does not. But what if we turn aside and God doesn’t call to us? What if we hear only the sound of our own breathing? What if we don’t know if it’s God or our own imagination speaking? “Moses said to God, ‘If I come to the people and say that God has sent me, and they ask, ‘What is his name”‘ what shall I say to them?” Or we might ask: if I turn aside and believe I have come into God’s presence, how can I talk about that–not only to someone else, but how would I talk to myself about the experience of God’s presence? What words would form? What images or sounds? In a sense, there is no way to talk about it, to find words, to make the sounds. “God said to Moses, ‘I am who I am’…thus you shall say to the Israelites: “I AM has sent me to you.” I am who I am. It is the mysterious name. The name framed by Hebrew letters which have been translated as Yahweh in some Bibles. But this name is never spoken aloud by the Jewish people. It is too holy to ever be spoken aloud. In that sense there is no way to make the sounds, to form the words. Yet, this human limitation does not mean that God is absent. We can sense that God has spoken even if we cannot say the words or name the name. But mystery is not God’s only proper name. Transcendence is not God’s only way of being. After giving Moses the great mysterious name, God went on: “Thus you shall say to the Israelites, ‘The Lord, the God of your ancestors–the God of Abraham, the God of Isaac, the God of Jacob–has sent me to you.’ This is my name forever, and this my title for all generations.” God is not only beyond all words; God’s name is attached to human names: The God of Abraham, Isaac and Jacob, the God of Sarah, Rebekah, Leah and Rachel, the God of Mary Magdalene and Sojourner Truth and Martin Luther King. The God of Barbara. And there is always a blank space for you to add your own name. You see, God has a very long name and by this name God will be known forever. Mystery and revelation. Majesty and earthiness. Immortal, invisible, and inefficient–the Holy God waiting for you and me. So, let us go and see this thing that has taken place. (paraphrasing Luke 2:15—those were shepherds, but I think you get the drift). That’s the whole point. Incarnations are not part of our usual way of life. We do not always encounter God in ways or places that we expect. We generally have to travel a little beyond the wilderness and see and hear those things to which we often do not pay attention. What does this say about the idea of God calling individuals? How do you feel about your own “calling”? In a nutshell, this is the ideal. This is the passage that you put on your bathroom mirror or perhaps develop some new “app” for your iPhone. This is what it means to live a righteous life. But, as this passage also implies, righteousness is not lived out as an individual. Being “Christian”, being who God calls us to be, is not something that we can just put on a T-Shirt like a badge of honor; rather, righteousness is lived out in community. Righteousness is not something you achieve; it is something that you live. It is dynamic as it weaves its way through your life and your relationships. And if you look at this passage, everything here has to do with relationships—relationships within one’s own community, hospitality to strangers, blessing of one’s enemies, and peace in every relationship and interaction that our lives hold. Paul is probably not merely addressing specific problems in this one Roman community. Even though this probably is at least partially a critique of the culture in which he lived, there are just too many admonitions here—more than 30 in some translations. Paul is laying out a pattern of life that represents a calling to all of us. This is what life in Christ looks like in community. It is not vague or sentimental. This is what the Kingdom of God is—really is. This is not a moral judgment statement. It is an ideal. It is different from the culture in which we live. And you can’t help but notice that there are no distinctions in this passage. It is directed to all and for all. In fact, there is a real sense of humility present here. Being righteous has nothing to do with stature or membership; in fact, being righteous is probably in spite of these things. But, get real. We all know that ideals are hard to achieve. In fact, recognizing that one has “achieved the ideal” is less than ideal. But it is a challenge to the community to become something that they are not, to look toward this ideal, and to realize that God’s vision of what is good and righteous is at the very foundation of our being. In this vision, there is no room for exploitation or shame. There are no divisions of any kind. There is no one who is better than another. There is no one who is excluded. There are no winners and no losers. There will still be conflicts and disagreements. That is part of our working through our own understanding of God. But peace abides. It is genuine. So this is, really, even more than an “ideal”. This is the way that God becomes incarnate even in this life and in this world. But, again, we have to pay attention. We’re really meant to take off our sandals and step into it. It’s pretty overwhelming. How can we do and be all these things? I don’t think that that is where God is calling us. God is not sitting in some far off place waiting until we check all of these off our list. God is in our midst, lighting bush after bush, one at a time, so that we may live into who we are. That’s the ideal. Love from the center of who you are; don’t fake it. Run for dear life from evil, hold on for dear life to good. Be good friends who love deeply, practice playing second fiddle. Don’t burn out, keep yourselves fueled and aflame. Be alert servants of the Master, cheerfully expectant. Don’t quit in hard times; pray all the harder. Help needy Christians; be inventive in hospitality. Bless your enemies; no cursing under your breath. Laugh with your happy friends when they’re happy; share tears when they’re down. Get along with each other; don’t be stuck up. Make friends with nobodies; don’t be the great somebody. Don’t hit back; discover beauty in everyone. If you’ve got it in you, get along with everybody. Don’t insist on getting even; that’s not for you to do. “I’ll do the judging,” says God. “I’ll take care of it.” Our Scriptures tell us that if you see your enemy hungry, go buy that person lunch, or if he’s thirsty, get him a drink. Your generosity will surprise him with goodness. Don’t let evil get the best of you; get the best of evil by doing good. Which of these ideals stands out the most for you? What is the hardest for you? It is an overwhelming passage. Think about where God might be calling you to start. Which bush is burning for you? Just before this, Peter had responded to Jesus’ question, “Who do you say that I am?” Peter had confessed the famous words that Jesus was the Messiah. But just when he feels closest to him, Jesus rebukes him. Peter wanted to hold on to what was good, to hold onto life as it was. But Jesus reminded him that he was getting wrapped up in material, human things and losing sight of what mattered. This, too, is overwhelming. Following God is not comfortable or easy. Following God’s call is hard work. It is to do what is not expected. In fact, sometimes, it means you have to encounter burning bushes. Disciples are witnesses. They speak what others do not want to hear and name evil for what it is. And sometimes they get burned. The way of the cross is the way of faith. It is the way of claiming truth and life in the face of what the world says we cannot do. It is not martyrdom. “Bearing one’s cross” is not doing something that is counter to who we are. And it’s not doing something just to prove that we have the substance to do it. It’s been a long time since someone asked when I “found Christ”. Was he lost? It’s an odd question. And when you read this, getting “lost” seems to be what we are actually called to do. It’s not a call to find religion or find spirituality or even find Christ. It’s a calling to lose oneself in the ways of God, in the very being of God. It is not a calling to save ourselves, but to let ourselves get lost. It is completely counter to the way that our society tells us to live. Jesus is foretelling his own death and resurrection. There is trouble ahead. He is also giving the disciples a taste of the Kingdom to come. But there is more to come. But if one holds tightly to what one is losing, one cannot receive what one is being handed. The Kingdom is now. Pay attention. The directive to “take up the cross” is not really an invitation; it is the way to put down what you’re doing now and turn aside and see the burning bush. We can make the choice to follow or we can go on our merry way living the life that we’ve carved out. Jesus had the same choice. (And look what happened to him!) It’s not an easy one. And it’s not really the “right” one in terms of right and wrong. It is doing what we’re called to do; it is doing what we’re created to do. It is being who we must become if we will only be honest with ourselves. Maybe living a life of faith is as much about being honest with ourselves and with our real being than it is about anything else. But first we have to take off our sandals. What does the call of God mean for you? In what ways is a “calling” from God misunderstood in this world? And so let us seek that thread that we are in the tapestry of creation. There is no one to send but us. God is counting on us; calling to us to, to become the servants only we can be. May God grant us a taste of understanding and may we respond with all that we are. Amen. By the end of the Genesis story, Joseph and the rest of those with him had risen far in the Egyptian society. They were immigrants and yet they were accepted and had even achieved status and power. In fact, Joseph was second in command to Pharaoh. But things change. A new king was installed over Egypt who did not know Joseph and who actually feared the status and power that Joseph and the Israelites had gained. So very quickly Joseph and the Israelites moved from being accepted and welcomed guests to being suspect aliens that were feared by the Egyptian citizens. The new Pharaoh successfully characterized the Israelites as a threat to Egypt’s economy and way of life and with that fear instilled in them, the Egyptian society rallied behind their new leader. During this time, a man from the Tribe of Levi married and the woman had a male child. Rather than risk the wrath of Pharaoh against her child, she hid him and then eventually placed him in the river. Ironically, it was Pharaoh’s daughter that found the child and adopted him. And, even more ironically, it was the child’s mother who then received wages for being a nursemaid for the child. The child grew up as Pharaoh’s grandson. He was named Moses, which means “I drew him out of the water.” He would become the central figure in the Exodus story, the central figure in the way that God shapes Israel’s future. Israel’s future has been preserved. Even from oppression, comes survival. God can use this. Perhaps our message is one of sort faithful subversion. Perhaps we are called not to just follow in blind obedience but to respond with compassion and grace. Perhaps true loyalty (true patriotism, if you will) is not blind faith but rather a faithful response at every turn of whether or not our society and our world truly look like they are called to look. Sadly, parts of this commentary sound like they came from yesterday’s New York Times rather than a 3,500-year old Biblical text. Are we called to preserve our world and our society or are we called to transform it into something else? All through history, the world has gone through out and out paradigm shifts. Old ideas and archaic notions were given questions and did not have an answer to provide. So, things changed. Painfully, sometimes, things changed. Here, a life is brought into oppression and terror and creates life itself. Moses would lead the people out of their enslavement and to freedom. But they would never be the same again. It happened again 1,500 years later. A life was brought into oppression and terror and creates life itself. Jesus would lead the people out of their enslavement and to freedom. But we would never be the same again. So, why is it so important for us to preserve our society the way it is? Why do we fear those who are different? Maybe in this time of wars and airstrikes and uncertainty; of arguments over budgets and debt ceilings and insurance and who is actually “American”; of the juxtaposition of natural drought and human oppression as it creates a moral and physical crisis around the globe; of fears over terrorists and loss of life as we know it—maybe now is the time when we are called to look anew at what God may be calling us to do. Maybe a newfound freedom waits just over the horizon. But we will never be the same again. Thanks be to God! What image of God does this story depict? What about this story mirrors our own society? What things do we clutch and try to preserve that may be getting in the way of what God is calling us to be? Continuing with Paul’s Letter to the Romans, he now focuses not so much on whether or not Israel figures into this salvation formula, but on the newly-formed congregations themselves. These are more than likely “house churches”, small congregations of a few families and individuals that are finding that they are a lot more diverse than they thought. So Paul begins by calling the congregations to see themselves and all they are as a sacrifice to God. For Paul, submitting to God means letting go of the allegiances of this world, those things that get in the way of who one is being called to be before God. It is a call to renewal of one’s whole self before God. Paul then turns to a warning to people not to think too highly of themselves or their spirituality, not to see themselves as better or more spiritual or more gifted than others. It is a calling to a spiritual maturity that will move one past the need to validate oneself. Paul repeats the image that he used in the Corinthian letter of the church as a body, composed of everyone’s diverse gifts. And together as a body, the church can be the church. Everyone’s gifts that they bring to the table are important and necessary for the Body of Christ to BE the Body of Christ. Paul challenges us to see ourselves as the embodiment of Christ in the world, not primarily as individuals but as local communities, yet belonging also to a larger whole. Difference is acknowledged. People are not all the same. They do not all have the same abilities. The common life is nothing other than the life of Christ, the life of the Spirit. This remains the constant. We are not asked as individuals to be Christ or Christs, let alone saviours of the world, although many suffer from this misconception and the burn out it produces. We are asked to be members of a body, of Christ, and to play our part – not more, not less. It is essentially a discussion about stewardship, about using what God has given you and infused into your life to build up and bring in the fullness of the Kingdom of God. The truth is, spirituality is not something that is generally measurable. I mean, really, what does it mean for one person to be more “spiritual” than another. Living into God’s calling means surrendering to God; it means getting oneself out of the way. Instead of figuring out what we need to do for God, we are called to listen to what God is calling us to do for the world. C.S. Lewis once said that “all genuine religious conversions are blessed defeats.” So, are we trying to be spiritual or are we trying to listen to what God is calling us to be? What does it mean to surrender to God in terms of our spiritual life? How well do we use everyone’s gifts to be the Body of Christ? This Scripture also appears in the Gospel version written by the writer who we know as Mark but Peter comes out looking a little different. There, Peter fails to understand who Jesus is and is all but characterized as one who is not with Jesus or some sort of outsider. But here, Peter comes out looking pretty good. He depicts the true disciple who understands who Jesus is and the significance of Jesus in the broader picture. This interaction between Jesus and the disciples is probably the writer’s way of trying to clarify understandings of Jesus and his work and perhaps clear out some of the “misunderstandings”. Keep in mind that in 1st century Judaism, the name “Mashiah” (Messiah) had several different meanings. It essentially means “anointed”, or “one who is anointed” for a specific purpose and vocation. That could mean a prophet, a king, a warrior, or a savior. From that standpoint, the “Messiah” probably meant to each person whatever it was that would fulfill the needs and fears of that person. Also keep in mind that this version of the Gospel was probably written after the destruction of the temple and the devastation of Jerusalem. There were real fears present. There were real questions. OK, then, who IS the Messiah? Who is going to help us now? And what does that mean? Some people saw Messianic qualities in John the Baptist; others in Elijah; others in Jeremiah or others. They saw in those people the answer to their questions, the answers to their own unique array of issues, problems, and fears. But those people were gone. (And, at the point of this writing, so was Jesus!) And yet Jesus, as Messiah, lives as God’s Spirit moves and works through the community of faith building the kingdom of God. The meaning was not one that could be “nailed down”; instead it has to be lived out in one’s life. The passage ends with Jesus’ directive to keep what is called the “Messianic Secret”. Why? One would think that he would want it shouted from the rooftops. And yet, the truth is not revealed until well after the Resurrection. It, again, has to be lived into. This writing is pointing to what is to come. As the story continues, Jesus’ earthly life will come to an abrupt and painful end. And, yet, the story continues, bound in heaven and hear on earth. You just have to live into it to get the full meaning and realize that God’s creative power is always and forever loose in the world. There are lots of understandings of God in this world. (Actually, who are we kidding? There are several understandings among those who are reading this right now!) Some understandings resonate with us; some challenge us; some make us uncomfortable; and, frankly, others probably just get in the way. This is not a God to be explained but one to follow. So, then, who do you say Jesus is? Jesus is not a model of the way we should be; rather, Jesus lives through us. So how does that change the answer to the question? What does the notion of “Messiah” mean for you? What would our church look like if we truly understand this notion of the “church” represented here? What makes you realize that “creative power of God” in our world today?